lt;stronggt;SMD64092lt;/stronggt;lt;BR/gt;Smead Tuff Hanging Folder with Easy Slide Tablt;BR/gt;Seven times stronger than the leading competitor's hanging folder. The specially designed reinforced rods are 40% stronger to resist bending and paper tearing. The heavy-duty oversized poly tabs easily slide and secure into the position you choose. Replaceable white tab inserts included. 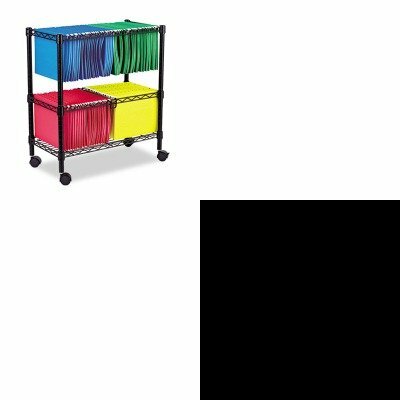 Hanging File Folder Type: Standard Size: Letter.lt;BR/gt;lt;BR/gt;lt;stronggt;ALEFW601426BLlt;/stronggt;lt;BR/gt;Smead Tuff Hanging Folder with Easy Slide Tablt;BR/gt;Mobile files help keep paper work handy when you need it and out of the way when you don't. Four 2amp;quot; hooded casters, two locking. Bottom shelf adjusts in 1amp;quot; increments and is rated at 250 lbs. Assembles without tools. Accommodates letter and legal size hanging files. Versatile front to back or side to side filing. Color: Black Overall Width: 26amp;quot; Overall Depth: 14amp;quot;.